All Air Services offers a variety of air conditioning services for residential customers. This includes general servicing of your air conditioner(s) and a fault finding service for systems that are not working or have issues. We also offer residential routine maintenance packages to further reduce the cost of your air conditioning servicing. A general air conditioning service is regular maintenance to keep your system(s) clean and running efficiently. Air conditioning systems are NOT maintenance free and do require regular attention. We recommend that your system(s) is maintained annually as a minimum, or depending upon the environmental conditions at your location, twice a year as the seasons change. You have made a substantial investment in your system(s), and regular air conditioning service will protect this. If you look after your air conditioner system(s) you can enjoy climate controlled comfort for years to come. Inspection of housing, pipework and insulation for corrosion and wear. Check for abnormal noises and vibration. Observe overall operations of the system. Check electrical box and terminals. Diagnostic call out or breakdown visit is a fault finding service for systems that are not working or have running problems. Your system may not be responding, making a strange noise, tripping the circuit breaker in the electrical box or a number of other faults. In this situation we will send out our experienced refrigeration technicians to assess and diagnose the problem. Some faults can be easy to fix by yourself, if you currently have a system that is not working, it is always worth checking the following before you call as it may save you a callout fee. Check the batteries in the remote and change if required. Try a hard reset on the system by switching off the power either at the isolator located near the outdoor unit or the circuit breaker in the electrical box and leaving off for at least 10 minutes. If you have a wall controller the fault code will be displayed on the screen. If you have a remote controller there may be a series of flashing LEDs on the indoor unit – note down the sequence of flashes for reference. 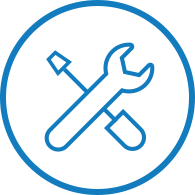 Our call out charges include up to an hour of the technicians time; if he can fix the issue in that time he will – if not he will forward his findings back to the office and we will then send you our recommendations for repair. If your system is under 5 years old there is a good chance that it is still covered under warranty by the manufacturer. All Air services are the warranty repair agents for a number manufacturers. If you believe that your system has failed under warranty then you must contact the manufacturer or the supplier and they can guide you through the repair process. If we are contacted by the manufacturer we are given a request to carry out an independent inspection of the system and an assessment on the reported fault. If the fault is with the air conditioning equipment then the repair will be covered by the manufacturer. If the issue is deemed to be non-warranty then we would charge the standard diagnostic call out rate. Poorly maintained system i.e. filters blocked, obstruction in air flow etc. If you are charged due to an installation fault, this should then be taken up with the installer. It is always worth contacting your installer prior to lodging a warranty claim. © 2015 All Rights Reserved - Allied Air Services Pty Ltd trading as All Air Services.